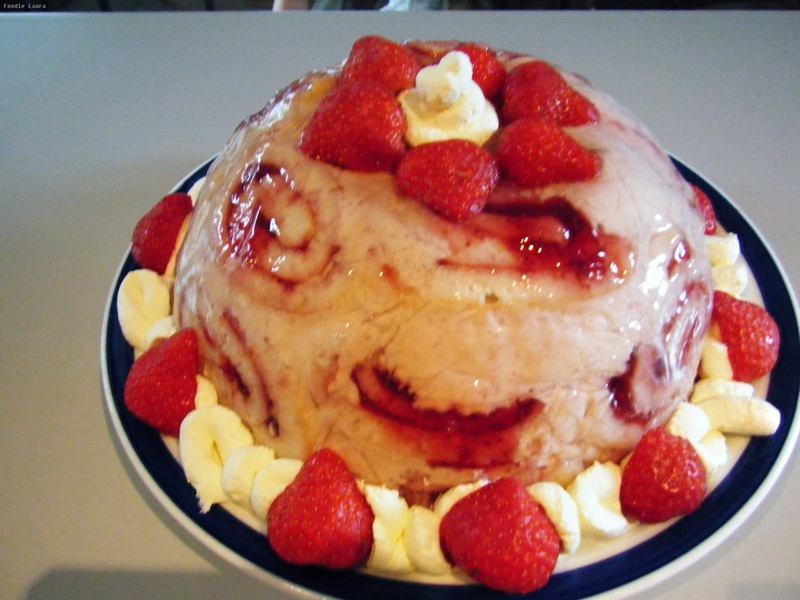 Tonight is the last episode of Bake Off and I haven't even written about our amazing Charlotte Royale from last week, they were referring to it as a brain cake on the show, the arrow root which gives the glazed finish does have very slimy texture and if the pale pink mousse seems through the cake does have a brain like appearance. We bought the strawberry jam rather than make our own because strawberries are a bit out of season now but everything else was from scratch. Our Swiss role was perhaps a little too thick as we didn't have enough left to make a base. Fortunately, the mousse set very solidly and we didn't need the swiss role as an element for support. It was a raspberry mousse that filled the dome of the cake and it tasted lovely, much lighter than I expected. The recipe we followed was much too voluminous and we were left with three large wine glasses of mousse, that made a dessert on their own and of course we didn't let them go to waste. There was a very Ruby like moment when we forgot to put cling film in the bowl but Trevor's reaction was somewhat different, he just took the swiss roll out and lined the bowl, no tears. I wondered this week if Ruby might crack up completely under the pressure and thought that for her sanity she should be the one to leave. I was sad to see Becca go she's been a great contestant and seemed to enjoy the competitive element. I've heard the winner has already been leaked online and I've also heard some of the contestants blogs have had been very reworked. I am trying desperately to avoid the news. It would totally spoil it for me, I like the excitement and the anticipation. I don't like knowing what my Christmas presents are either, only a few hours to go so here's hoping for no spoilers.